VAAI is a set of VMware vStorage API and SCSI commands designed to provide and efficient communication between ESXi hosts and storage arrays which implements specific T10 storage standards. The APIs define a set of “storage primitives” that enable the ESXi host to offload certain storage operations to the array. It reduces resource overhead on the ESXi hosts and can significantly improve performance for storage-intensive operations such as storage cloning, zeroing. 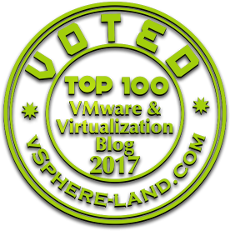 The goal of VAAI is to help storage vendors provide hardware assistance to speed up VMware I/O operations that are more efficiently accomplished in the storage hardware. Without the use of VAAI, cloning or migration of virtual machines by the vSphere VMkernel Data Mover involves software data movement. The Data Mover issues I/O to read and write blocks to and from the source and destination datastore. With VAAI, the Data Mover can use the API primitives to offload operations to the array if possible. VAAI provides Atomic Test & Set (ATS) during creation and locking of files on the VMFS volume. VAAI Provides Clone Blocks/Full Copy/XCOPY, which is used to copy or migrate data within the same physical array. Operations Like ATS/Clone Blocks/Full Copy/XCOPY can be controlled with the help of advanced parameters like HardwareAcceleratedLocking, HardwareAcceleratedMove. Refer Below KB Article for more information on VAAI.